I don't think candlestick patterns can predict the future, but a few of them offer quick and easy ways to convey a certain theme in the market. One of the clearest patterns is the "engulfing pattern." This happens when today's candlestick completely engulfs yesterdays's (in the sense that it has opening and closing levels that fall outside the range set by the previous day. In other words, prices/yields/whatever just moved way more than they did in the previous session, so the direction of the move should carry a bit more weight in terms of speaking to underlying momentum. 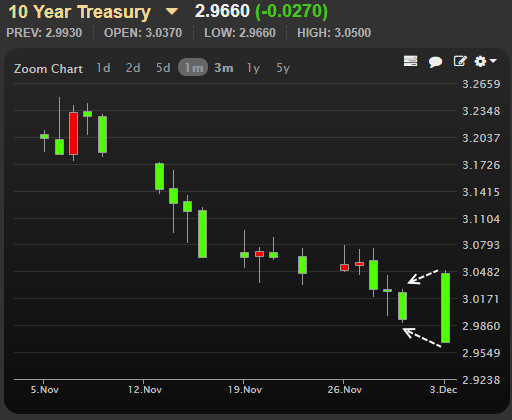 With all of the above in mind, today's 10yr yield candlestick easily engulfed the last 2. There's an outside chance that today's strength simply represents a glut of "new month" tradeflows and that it will serve as a cue for overseas markets to bet against Treasuries overnight. But to whatever extent we hold gains tomorrow morning, we'll be witnessing confirmation that bonds are taking bigger picture shift potential very seriously. Specifics didn't seem to matter to bonds too much today (another good sign). ISM Manufacturing came in stronger than expected, but didn't cause more than a few brief moments of weakness. Without any over justification, bonds just kept rallying from there, even as stocks and oil prices bounced higher in the afternoon. A recap of Alerts and Updates provided to MBS Live subscribers. A recap of featured comments from the Live Discussion on the MBS Live Dashboard. Matthew Graham : "for sure, but they're just making sure you know their job isn't always easy." Andy Pada, Jr. : "isn't that their job?" Matthew Graham : "well, when econ was performing well and rates were near zero, it was not a challenging period for normalization. The writing was on the wall and there was no question that they should be hiking rates. Now that they've hiked a fair amount and are getting close to "neutral," as they say, it's more challenging (relatively) to know when to stop hiking, or how to change other policies like IOER and reinvestments." Andy Pada, Jr. : "what is "challenging?"" Matthew Graham : "RTRS - FED'S KAPLAN SAYS 'WE ARE IN A MORE CHALLENGING PERIOD' IN OUR EFFORTS TO NORMALIZE MONETARY POLICY"
Matthew Graham : "RTRS - KAPLAN SAYS HE IS PAYING ATTENTION TO SLOWDOWN IN GLOBAL GROWTH, AND EXPECTS U.S. GROWTH TO SLOW NEXT YEAR"
Matthew Graham : "RTRS - FED'S KAPLAN SAYS HE IS FOCUSED ON NOT BEING PRE-DETERMINED ABOUT THE FUTURE PATH OF RATES"
Amy Humphries : "I just received my first email from one of our investor re:wednesday "We will still be publishing rate sheets and accepting locks on Wednesday, December 5th, despite the SIFMA recommended market close in honor of former President George H. W. Bush""
Alan Craft : "Bond market closed = lock desk closed"
Amy Humphries : "Has anyone actually received any notices from lenders saying they (or their lock desk) are closed Wednesday?"